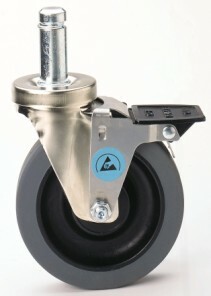 Metro ESD casters control electronic discharge and absorb shock. In order for them to work, the floor must be ESD. Furthermore, the plastic sleeves attaching the shelves to the posts should be ESD or you can use aluminum sleeves.